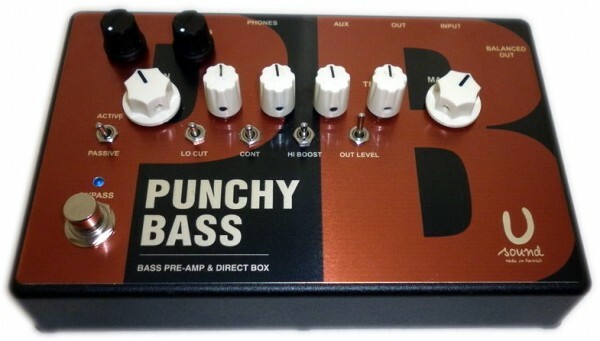 Punchy Bass" - this is a solid state Preamp - DI Box for bass guitar. Preamp has a four band EQ, control Gain, Volume, plus multiple tone shaping switches. The device is hand built using very high quality, selected components. This high quality preamp can be used for home music lessons, and for the performances on the large stage, as well as finding application in the recording studio. Built-in headphone amplifier with volume control. Built in mini mixer for connecting an external audio source (CD, computer, etc.). It is convenient for use with a "backing track". Outputs - regular and active balanced (Jack, XLR), and a headphone output. LO CUT - is a bass roll off and is used to control stage rummble at high volume. MID CONTOUR - puts a notch at about 500 hz giving a mellow sound. HI BOOST - adds edge and defenition. 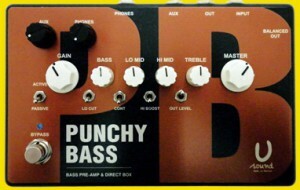 VOLUME BOOST - switch mode Preamp/Pedal.